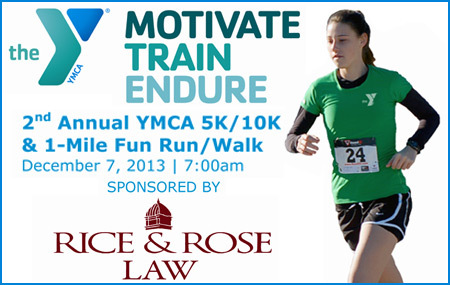 Rice & Rose Law is sponsoring the 2nd Annual YMCA 5k/10k & 1-mile Fun Run/Walk to be held in the Hunters Ridge Subdivision (3 miles west of I-95 on State Road 40) on December 7, 2013. This 5k/10k Fun Run/Walk will put your physical endurance and mental strength to the test. This event is great for beginners and the most passionate fitness enthusiasts of any age. The average weather in Ormond Beach during December is a high of 74 degrees and a low of 54 degrees. The races start at 7:00am, which should provide optimal running conditions. Join us at the starting line for a fun and challenging experience. Click here for complete event information and registration form.